This really is one of the most spectacular legs of the walk with many possible route alternatives. Shiel Bridge itself, huddled on the edge of Loch Duich in the shadow of the imposing Five Sisters of Kintail is a pretty special place to be. But the trail takes you inexorably forward and making the most of a good path you climb from Morvich past Bealach na Sroine to descend past the impressive falls of Glomach (a tricky descent on a narrow path with exposure to the ravine on one side). Once you cross the River Elchaig you have a route choice to make (see route alternatives below). The main route turns east to Iron Lodge before heading north past Maol-Bhuidhe bothy (a convenient overnight stop NH 052360). Although there are more direct route alternatives that you may prefer in bad weather, this is some of the wildest, most unspoilt country in Scotland so it seems a shame to miss it. There are also plentiful wild camping opportunities. This is rough country, so don't underestimate the time it will take you to cover your distance. From Maol-Bhuidhe the track heads north then west, skirting Beinn Dronaig on a faint stalkers path before descending to the well-appointed estate bothy at Bendronaig Lodge (it even has a flushing toilet!). From Bendronaig the path continues west heading up and over Creag Dubh Bheag before dropping down to Strathcarron. Here there is a welcoming hotel where you can also camp (with permission) and a train station. The Strathcarron Post Office also has wifi access and a small general store selling a limited range of food and supplies. If you're doing the trail in sections, this is a good break point and marks the end of the first section. This leg provides you with the most opportunities to stray from the "main" route. For instance, after descending from the Falls of Glomach you could head west along the River Elchaig (good wild camping spots abound), passing Camus Luinie (where there is a nice bunkhouse) and Killian before heading up Glen Ling and climbing north east, through the forest to pick up a 4x4 track that takes you on a dog leg towards Bendronaig Lodge, before rejoining the main route to Strathcarron around NH 995386. Previous guides have suggested descending to Attadale and then continuing to Strathcarron on the road. This is definitely not recommended. The road is fast with several dangerous blind bends and should be avoided unless in an emergency. 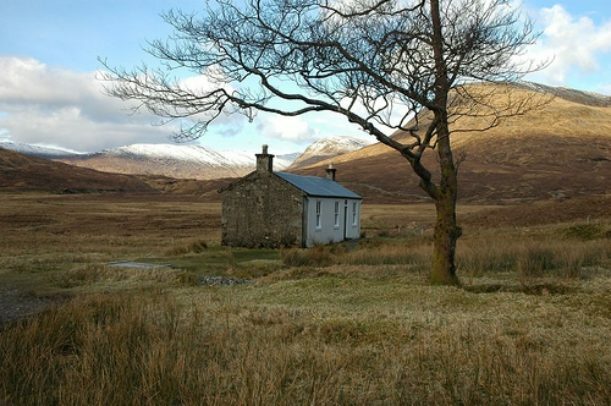 If you follow the main route to Bendronaig Lodge, you could then head North to the wonderfully isolated Bearneas (where there is another bothy NH 021 431) before heading northeast to Bealach Bhearnais and descending to cross the river at Pollan Buidhe and then North to Craig. Looking at the map there is the temptation to avoid Craig and to take a much more direct route to Achnashellach by climbing directly from Bearneas via Baobh-bhacan Dubha over Carn Mor before descending through the Achnashellach Forest to cross the river. Unfortunately the river is the main problem with this promising alternative - it is wide, and can often be difficult to cross. If you're dead set on going this way and find the river un-fordable, you could always divert 3.5km to the East along the forest track to use the bridge at Craig). From Craig (home to the legendary Gerry's hostel)there's the option to follow the road for a short stretch towards Achnashellach or climb on a rough track to Coulin Pass. This route alternative is designed to link with the route alternative described in the next leg that heads to Kinlochewe via Toran Cuilin. You can view this route alternative on an OS map here.